Although I received my official MA results back in June, last week was the graduation ceremony to officially celebrate my achievement. The ceremony was held at The Lowry, Salford Quays on a glorious, hot Thursday afternoon. I was thrilled to arrive in the robing queue at the same time as members of my graduating cohort so the lengthy queue went by without incident as we caught up with each other from the previous summer. What made this day extra special for me was the attendance of my loved ones. Sons, husband, parents and father-in-law all braved the blistering heat to watch me walk across the red carpet at The Lowry. 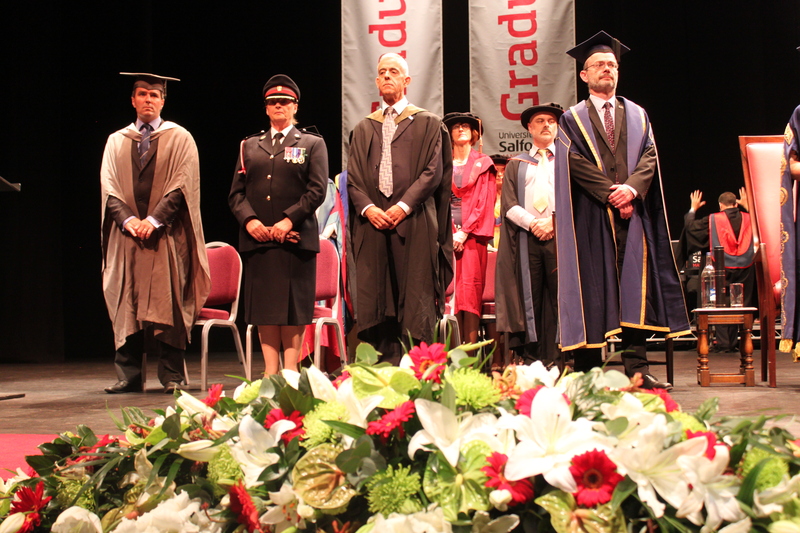 The ceremony began with a band and a singer all associated with the School of Arts and Media at the University. Speeches were made and thankfully I wasn’t waiting long before we were gathered to begin our queuing to the stage. I’d forgot that they award the highest to lowest educational attainment. Those receiving their PhD’s were first up, followed by my group of Postgraduates. 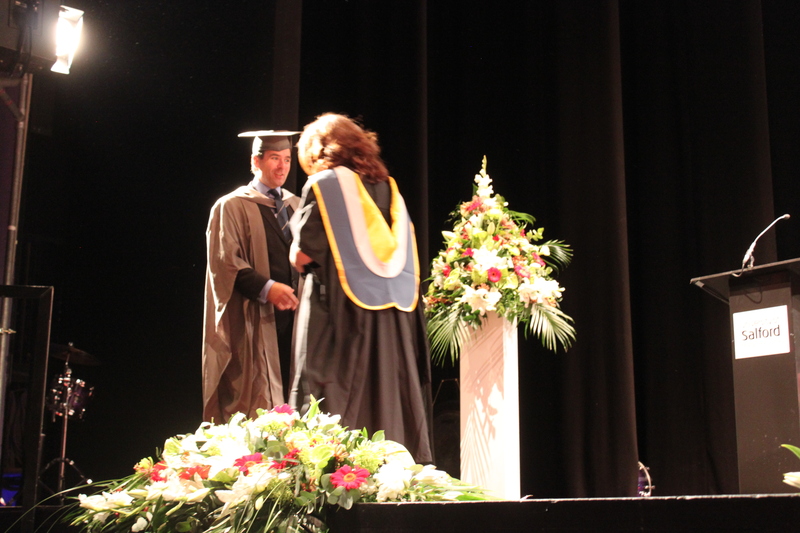 I recall being extremely nervous when receiving my undergraduate degree in 2009, but this time I had my family on the front row and I could only see my youngest son’s huge smile when I walked up to the stage steps. How could I be nervous when that beautiful smile was beaming proudly at me? The ceremony lasted an hour and it was superb from start to finish. I savoured every minute of it, being with my classmates and family under one roof. Once the ceremony closed I marched my family upstairs to more queues. I wanted a professional portrait with all of them before we finished the day with a lovely meal. It was the perfect day to mark the end of one of the biggest journeys of my life so far. From that very first lesson back in September 2011 when I nearly didn’t go back to class after the break because I thought I was in way over my head. The course not only educated me in terms of learning the craft of scriptwriting, it has sparked a real passion in radio drama which I didn’t know was there and has given me the confidence to rise to any challenges that come my way in future. 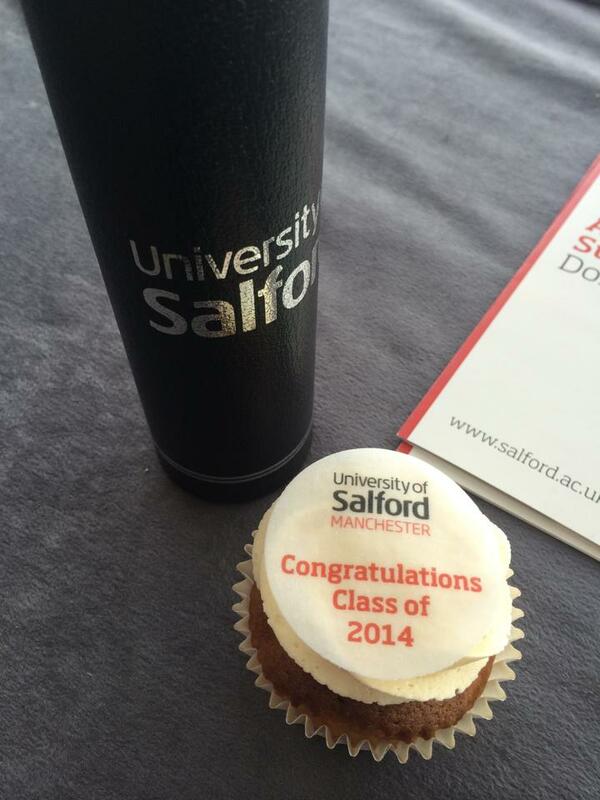 Thank you University of Salford. Here’s to the next journey. 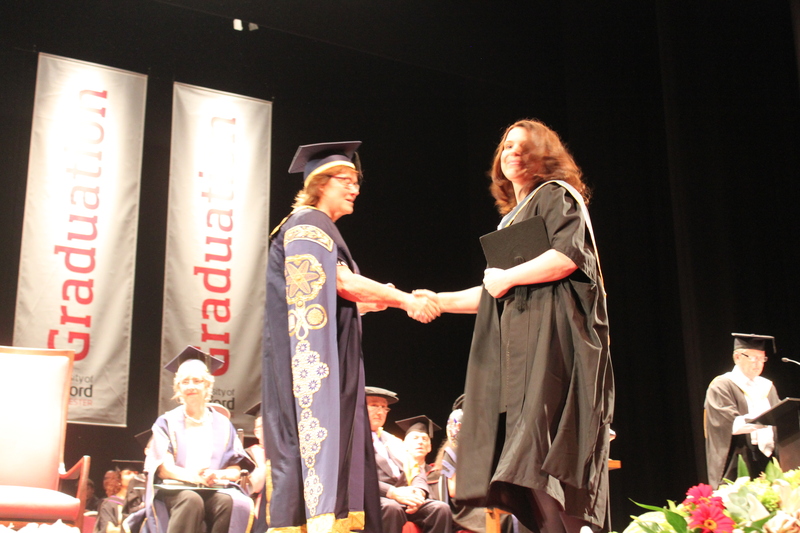 This entry was posted in Blog, Writing and tagged graduation ceremony, MA, radio drama series, Salford Quays, scriptwriting, university, University of Salford. A mascot is : A person or thing that is supposed to bring good luck or that is used to symbolize a particular event or organization. One thing I enjoy about taking part in the #wpad challenge is that some of the prompts make me start to think about things in a different manner. I’ve never contemplated having a writing mascot before; does a bottle of wine count as one? Because when that bottle is by the side of my laptop and I’ve consumed a glass or two then for some bizarre reason my fingers and brain come alive. I guess the alcohol from the bottle symbolizes a sudden rush of creativity – therefore would be classed as a mascot? As I embark on my final masters project in September which will hopefully produce not only two exciting episodes of television, a calling card script and some confidence in my ability. Perhaps it would be a worthwhile investment in purchasing a writing mascot that accompany me to my graduation ceremony if I pass the script-writing degree. This entry was posted in Blog and tagged #wpad, blogging, bottle of wine, card script, graduation ceremony, MA, masters project, scriptwriting, university, writing.